This was our first time staying here. We brought our 3 kids to enjoy a nice cabin retreat. They loved it. Spent the first 2 days just exploring Bryson City. We strolled around Bryson and enjoyed the quiet on Christmas Day. Enjoyed Cherokee on our last day. Enjoyed the hot tub in the evening. Had a great time, hope to return next year. Thank you for sharing your beautiful cabin with us. We had a wonderful Christmas and made wonderful memories to share with our families. We enjoyed hiking on the property, building a fire in the fire pit, relaxing in the hot tub, playing pool and fooseball. Deep Creek Trail in the Smoky's was a great trail to hike. Beautiful waterfalls. This place is awesome! Can't wait to come back. We loved the Polar Express, gem mining, Darnell Farms. Loved playing pool. Enjoyed our stay so much and it was peaceful and beautiful. Hot tub was clean and fabulous, deck in the morning overlooking mountains was so wonderful. Didn't see anyone the whole time which was perfect for me and my family. Christmas in the cabin was the best for memories to cherish forever. We decorated our tree and hung more outside lights while enjoying the fire place. The hot tub was very relaxing. Drove to the Biltmore and it was beautiful and enjoyed playing at the Casino a few times. But that aside from that it is one beautiful cabin. Loved the decor and spacious bathrooms and did I mention that fabulous hot tub!! Will definitely be back again and again . Everything was in mint conditions upon arrival, and we found everything as described on the listing. It is a great neighborhood, astonishing views, safe and quiet! They have an excellent service, good and accessible communication, and everything in the cabin has accurate instructions for all the appliances and instructions for the departure. Everything was in mint conditions upon arrival, and we found everything as described on the listing. It is a great neighborhood, astonishing views, safe and quiet! They have an excellent service, good and accessible communication, and everything in the cabin has accurate instructions for all the appliances and instructions for the departure.We loved absolutely everything!!! The views, the jacuzzi, the different levels arrangement, the town, etc. The beds were very comfortable, and the temperature settings were perfect! Everything was in mint condition upon arrival, and we found everything as described on the listing. It is a great neighborhood, astonishing views, safge and quiet! The have excellent service, good and accessible communication, and everything in the cabin has accurate instructions for all the appliances and instructions for the departure. We loved absolutely everything!! The views, the Jacuzzi, the different level arrangement, the town, ETC. The beds were very comfortable and the temperature settings were perfect. We had an amazing time! The cabin was perfect and the view was stunning. Can't wait to visit again! 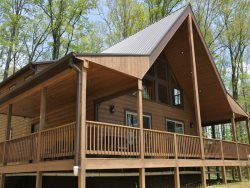 The cabin was great for our family. The fireplace kept everything nice and toasty. The view was absolutely astonishing. The Kids say we were on top of the world! The pool table was a nice touch to the cabin and we all had so much fun. Our Tradition continues. We love Bryson City and the surrounding mountains especially. So Blessed, thanks for being a part of it for 3 years running and making it so special for our family. We had a wonderful time! Perfect place for our family. Thank you for sharing it with us. We hope to come back, again and stay in the same place!! God bless.